It may be 'only a point five' update, but there's plenty on offer in the latest version of Cubase. 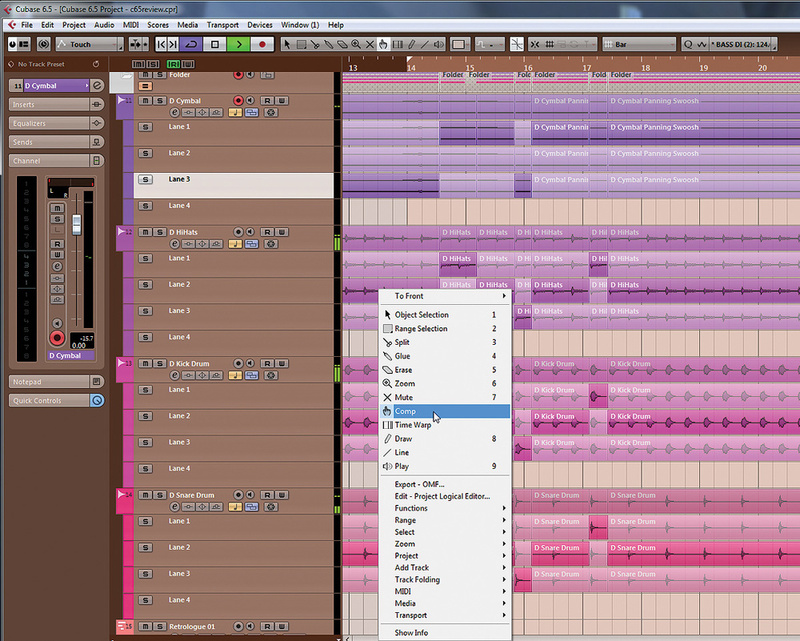 Don't panic: Cubase hasn't gone brown for 6.5, this is just how I like it! Above is the new comping tool, which can be used with the group-editing feature to save hours of tedious multitrack editing. As a long-time Cubase user, I've seen many major updates to Steinberg's flagship music-production software, and the latest brings us up to Cubase 6.5. 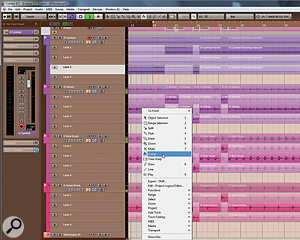 Updates are available both for the full version, as reviewed here, and for Cubase Artist. Cubase 6.5 does not at first sight appear to be the most major of overhauls, and some users have complained about having to pay for a '.x' version. But after evaluating v6.5 for several weeks, I don't agree: there's some really useful new functionality, and significant enhancements to existing facilities that should prove worth the modest upgrade price. Version 6.5 also includes plenty of bug-fixes, and when it was first launched, this was the only way you could get hold of them. Since then, these fixes have been incorporated in Cubase v6.0.7, which is a free update for Cubase 6.0.x users (for full details, and to download the updaters, go to www.steinberg.net/forum/viewtopic.php?f=34&t=21918). So what exactly does your money buy you with Cubase 6.5? Notable additions include two new VST synths and a couple of new EQ and filter plug-ins, as well as an update to the VST Amp Rack guitar amp, cab and effect modelling plug-in. There's also much-requested support for 64-bit ReWire (yes, it works — and there's very little else to say about that!) Finally, there are a number of new features designed to streamline editing and the comping of multitrack recordings. The first feature worth writing home about is a new dedicated comping tool, intended to streamline the process of piecing together the perfect virtual performance from a number of different takes. Its icon looks like a pointing finger, and can be accessed from the same tool palette that offers scissors, glue tool and so on. I'm pleased to report that it promises a significant reduction in the number and intensity of headaches caused by intensive comping! The way it works will be familiar to users of some other DAWs, notably Apple's Logic Pro, which I believe was the first to adopt this approach. With the different takes displayed beneath each other on lanes, all you need to do to comp the perfect performance is select the comp tool and 'paint' the areas on the different takes that you wish to hear. This is a vast improvement over the previous system, where you had to use the pointer, scissors and mute tools to identify and bring to the 'front' the elements you wished to comp together. It has made this common task both easier and faster. Steinberg have gone a step further, though, by adding some useful menu options. When you've selected the desired regions of your comp takes, you can right-click (Ctrl-click on Mac) to access a small drop-down menu offering an automatic Clean Lanes function, which takes care of the minutiae, such as overlapping takes. The same menu also features a Create Tracks From Lanes function which 'mults' out each lane, complete with comp selections, to its own audio track, on which you're able to alter levels, add effects and perform all the usual operations you might do on an audio track. This means that, as well as comping with it, you could use this tool as a convenient method of picking out the odd word, phrase or note to be treated with spot effects while mixing or remixing. For me, the new approach to comping alone would be worth the upgrade price, but it gets better: when used in combination with the group-editing functions that were introduced in Cubase 6.0, it can save quite literally hours of tedious editing of multitrack, multi-take parts such as backing vocals and drums. As with all group editing, all you need to do is to make sure the multi-mic recordings are on adjacent tracks, select all the tracks, right-click and choose the Move Selected Tracks To New Folder option. On the new folder track, you click on the '=' icon beneath the mute and solo buttons to enable group editing, then select your comping tool and get to work. It really is that simple — and it worked flawlessly in my tests, except when I'd inadvertently included a wrong audio track in the same folder. In this scenario, you'll get a helpful warning that not all the files are in sync, which denotes that you've either inadvertently nudged a track, or included one in the folder that shouldn't be there (from a different instrument, for example). This is a most welcome addition to Cubase. If I were looking to buy a plug-in to do such a job (if one existed), I'd expect to pay a fair whack for it, so the modest upgrade price is beginning to look very reasonable. One very minor issue that I noticed while testing this new function isn't new to v6.5 but is worth a brief mention in case anyone reading gets confused by it: when in group editing mode, it's still possible (admittedly via a somewhat convoluted route) to throw group comps out of sync, by double-clicking on a part to open the track's sample editor and changing the start and end point of a region on that track. When you return to the Arrange page, you'll find that the region length has only changed for the selected track, not for the others in the group — and because of this, that one track's comp selection will no longer quite match that of the others in the group. It's a loophole which ideally Steinberg will close, but the easy way for the user to avoid this, of course, is not to be stupid enough to do this sort of edit in group mode in the first place — and now you're forewarned, you've no excuse! The ability to slice, quantise and stretch audio has been present in Cubase for a while now, and although the tools work well, I've always felt that they should be rather better integrated — and so too, apparently, did Steinberg, because in 6.5 they've overhauled all of this, making the various tools work much more closely together. It's easy to overlook this sort of improvement because there aren't really any new functions here — you can't do anything you couldn't do in Cubase 6 — but it's a very useful rationalisation of what went before. By way of example, when you detect hitpoints, the same window now presents you with the opportunity to create warp tabs or markers based on the position of each of those hitpoints. Previously, you had to perform a number of separate steps to achieve the same result. A more useful facility for me is the support for FLAC audio files. FLAC is a lossless data-compression format for audio, and it now appears in the list of import/export options. I can see this being incredibly useful to anyone wanting to archive projects or media pools to DVD, for example. All this talk of imports and exports also provides me with a rather tenuous segue to the fact that Cubase now supports the Chinese language. I'd love to be in a position to say that I've tested that, but I'm afraid that the only kind of mandarin I'm familiar with is a small, orange and refreshingly juicy citrus fruit! Cubase has, perhaps unfairly, developed a reputation for lacking the virtual-instrument firepower available to owners of, say, Logic, Sonar or Pro Tools. Personally, I had very few problems with the existing synths, and have happily made use of Monologue, Prologue and Embracer despite possessing several costly third-party VST instruments. Sure, there are better soft synths out there, but as a starting point, these were capable of creating an extensive and very usable sound palette. The new Retrologue and PadShop VST synths. Nonetheless, Steinberg clearly thought that there was room for improvement and they've done their best to fill it with a granular synth, PadShop, and a subtractive analogue-modelling synth, Retrologue. Both are completely new, and are included in the full and Artist versions of Cubase. PadShop is also available separately (for the same price as the full Cubase upgrade), for use in other VST3 hosts, such as Presonus Studio One and FL Studio. Both synths sound pretty good, to my ears, and are very different from Steinberg's previous offerings. PadShop does much what you'd expect of a granular synth: it's great for creating breathy or bell-like, evolving, other-worldly soundscapes, for example. There are around 400 presets, and a number of controls both for the granular part of the synth, and for the obligatory filter, amplifier and other control sources (including two LFOs and a step modulator). Modulation and delay effects are built in. Using PadShop is a breeze. Everything's nicely laid out and the controls are pretty intuitive. The results sound pretty decent to my ear, as well. However, a significant disappointment is that PadShop appears to work only with its own bundled audio files: I was unable, for example, to take an excerpt from an audio file in the project I was working on, or a sample from my existing library, and use that as the starting point for a new sound in PadShop. That's a shame, as to me that's part of the fun of playing with a granular synth, so let's hope it gets added in future. Nonetheless, the plentiful presets mean that this synth is still capable of creating a wide range of useful sounds, and it should have appeal for anyone wanting to add texture to electronica or dance tracks, or perhaps people looking to write atmospheric soundtracks. Retrologue is much more my cup of tea, and will feel familiar to anyone who's ever programmed a subtractive analogue synth. It's a much richer, warmer-sounding creation than Steinberg's previous offerings: it sounds much better than either Monologue and Prologue, which is a pleasant surprise. The sound is created by three oscillators and a noise source. The two main oscillators offer a wide range of waveforms, as well as an intriguing 'cross' mode, where the two interact. For each, the pitch is set in three degrees: the octave, the semitone (coarse) and cents (fine). A sub-oscillator offers a choice of square, sawtooth and triangle waves, and the noise source provides pink and white noise, both 'clean' and band-pass filtered. A mixer sets the relative levels of these sources, and provides a ring modulator. The filter section offers a choice of 12 different filters, as well as a choice of tube distortion or clipping, and the usual ADSR filter envelope, and there's another ADSR for the amp. There's also the usual choice of modulation and delay effects. Then, of course, there are the two LFOs, each delivering one of six waveforms, which can be tempo-sync'ed if required. I was mildly disappointed to find there was no audio side-chain input for the LFO, which would have been a nice touch for creating more complex control modulations. The icing on the Retrologue cake, though, is the Matrix section, which enables the user to set up some pretty sophisticated control-source routing. As well as the usual LFOs, mod and pitch wheels, filter and amp envelopes and the like, you can select VST note expression inputs as the source. You can also set up routing buses within the Matrix, which gives you a massive degree of control if you're prepared to put the time into programming your own patches — and if you're not, again there's a generous complement of presets that will satisfy the lazier composers amongst you! All in all, then, this is a decently specified synth, and it sounds damned good to boot. 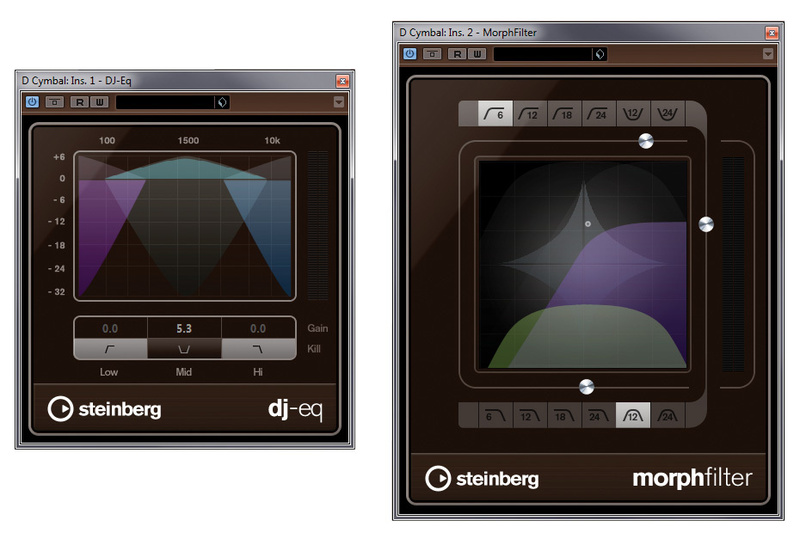 As I mentioned at the outset, there are also a couple of new filter plug-ins, Morph Filter and DJ EQ. Essentially, the Morph Filter offers a useful range of high-, low- and band-pass resonant filters, and allows you to blend between two of them at once. Again, it's a useful addition, particularly if you want to perform automated filter sweeps, and although it's hardly the most ground-breaking of tools, it works really well and sounds good. 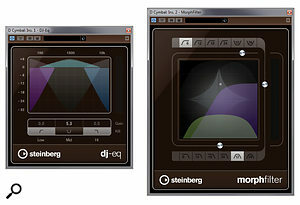 Also new are the DJ EQ and Morph Filter plug-ins. DJ EQ is, as the name suggests, a 'kill' EQ. It provides three EQ bands which can be boosted or cut to shape the sound as desired, and a kill switch for each band allows you to toggle between the boost/cut you've applied and complete removal of the band. To me, it's more of a performance effect, as its name implies, which might best be used in conjunction with a control surface of some sort — but I can see that it could also be used with automation to create interesting remix effects. With the exception of the old Quadrafuzz plug-in, for which I always had a soft spot, the VST Amp Rack plug-in is the first of Steinberg's guitar processors that I've really liked. 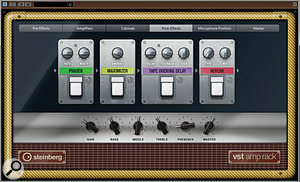 The VST Amp Rack has been overhauled and includes some new plug-ins. In Cubase 6.5, it has been developed further and it really is maturing nicely, with a few new features and plenty of new presets. The bottom line is that it sounds rather good, with several really usable amp and cab models, a decent array of effects that can be inserted pre- or post-preamp section, and a handy master section. We've also been given a couple of useful new effects for VST Amp Rack, a maximiser and a limiter, both workmanlike and welcome additions, but their presence does make me wonder why there aren't VST insert slots that allow you use Cubase's existing complement of processors and effects in VST Amp Rack. I do have one reservation, which is by no means a deal-breaker. When inserting this plug-in, there was a significant boost to the level of the signal, sufficient to clip at the output or in subsequent plug-ins in the chain. (I suppose you could argue that an amplifier should boost signals, but it's not massively helpful in a DAW context!) On the plus side, the plug-in now features both input and output level metering, so it's easier to see what's going on in this respect. As I stated at the outset, this is a genuinely useful update to Cubase, and if you're wondering whether to updgrade from Cubase 6, I wouldn't blink: it's well worth the asking price. If you're looking to buy Cubase for the first time, while it — just like any other DAW — is not going to please all of the people all of the time, I think the traditional criticism of its bundled plug-ins, limited routing flexibility, multitrack editing and so on are now out of date. With VST Amp Rack coming of age, a decent complement of synths, drum instruments and sample-based instruments, a great-sounding convolution reverb and an ever-growing list of bundled plug-ins, it's fair to say that Cubase has very much caught up with the pack in this respect. In other areas — such as groove and hitpoint detection, quantisation, multitrack comping and pitch and time manipulation, it's now up there with the best. And let's not forget that there are still more features (like the drum editor) that have been around for a while and are, for me at least, easier to use than on any other DAW. Certainly, whatever your DAW preference, it's hard to argue that anything else offers a great deal more functionality. And while the full price can at first appear a little daunting in comparison with that of some other DAWs (notably Apple Logic, Ableton Live, Cockos Reaper and Presonus Studio One), it bears comparison with others, such as Avid's Pro Tools 10 and Magix's Samplitude Pro X, and is not unreasonable. I've read a number of reports on the Internet of users suffering with installer problems in Windows, and should mention that I had frustrating time of it myself. The full installer is a hefty 8GB or so, so I opted to download the smaller update from Cubase 6.1. Unfortunately, the installer was corrupt: after three separate download attempts, it kept hanging when trying to unpack some files associated with PadShop. Retreating from that battle, I gritted my teeth and downloaded the full installer which worked fine on the second attempt (the first worked, but the PadShop source WAVs weren't installed). The exception was that I lost my Cubase 6 preferences. It took a while but, as you can see from the gloriously brown screenshots, I was able to retrieve the original XML preferences file! I should stress that there are plenty of people who have had no problems, and that after early problems with updater files for Windows, Steinberg made a new version available. In any case, I'd suggest that you stick with good practice and set a restore point on your operating system prior to installation. New comping tool is simple and effective, and makes multitrack comping a breeze. Retrologue synth sounds great, and PadShop extends the sound palette nicely. Rationalised hitpoint, groove, warp tab and marker functions are a real time-saver. 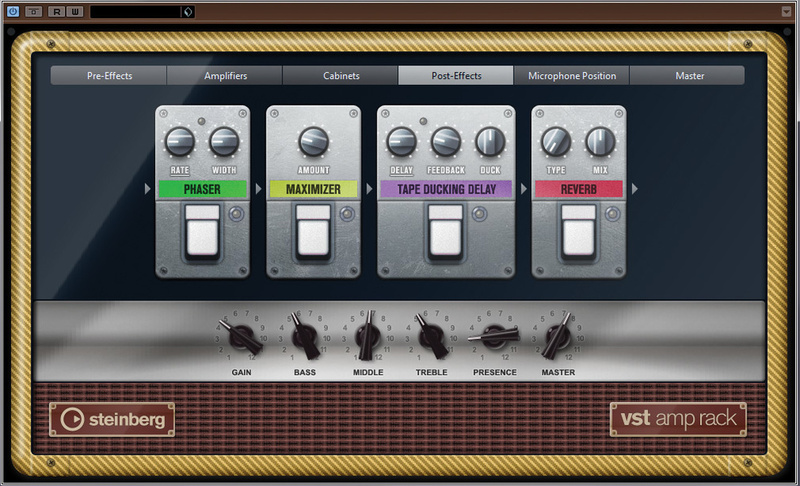 VST Amp Rack keeps getting better, and is now rather good. FLAC support saves disk space without compromising audio quality. Direct export of the mix to SoundCloud. PadShop can't import external audio files. A few installation teething troubles. While the headline updates don't appear, at first glance, to add up to a great deal, this is actually one of the most useful Cubase updates yet, and the program is maturing nicely. There are valuable additions for programmers and synth heads, as well as for anyone doing serious mixing and editing. The new group comping tool is probably worth the upgrade price alone if you often work with layered backing vocals or multitrack drums. Cubase 6.5 £508; upgrade from Cubase 6 £42.34; Cubase Artist 6.5 £253; upgrade from Artist 6 £42.34. Prices include VAT. Steinberg Media Technologies +49 40 21035 0. Cubase 6.5 $499.99; upgrade from Cubase 6 $49.99. Cubase Artist 6.5 $249.99; upgrade from Artist 6 $49.99. PC with Core i7 960 processor, Asus P6T Deluxe v2 motherboard, 12GB DDR3 RAM and ATI graphics card, running Windows 7 Ultimate 64-bit. Both 64 and 32-bit versions of Cubase installed.